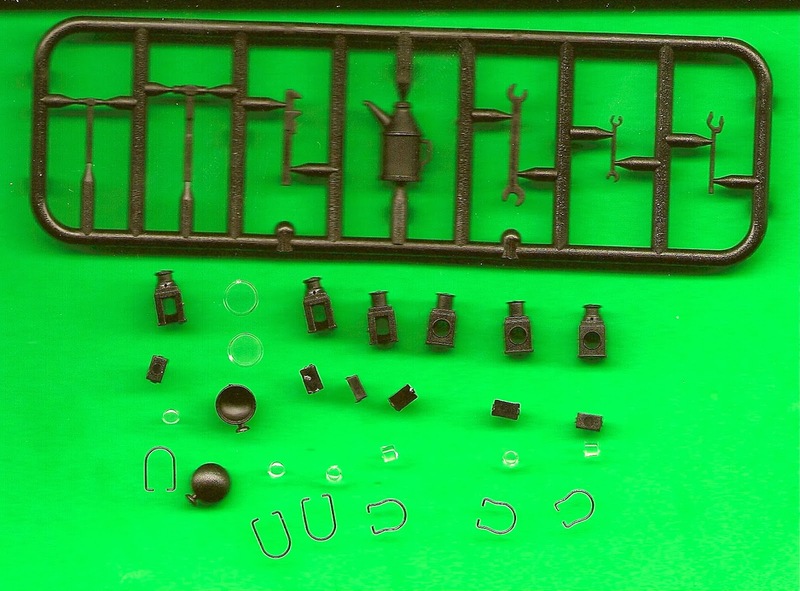 As promised, here are some pictures of the accessories that come with our 7mm scale Fowler diesel-mechanical loco. As you can see, a range of prototypical names (e.g. the first five) are mixed up with freelance ones. There actually was an industrial loco in Australia named Bunyip (a water-dwelling creature from Aboriginal myth) but it was a steam engine. Henry Lawson was a famous Australian poet. 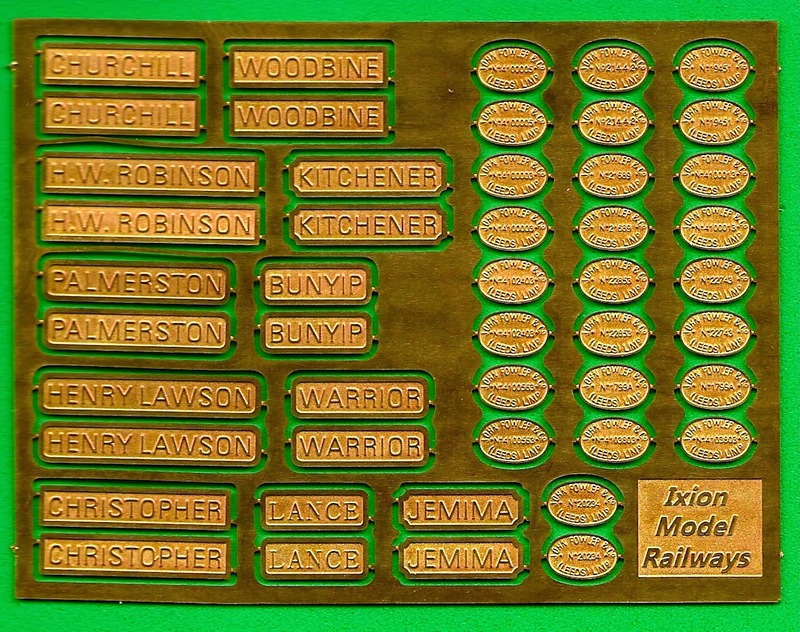 There are a range of prototypically correct maker's plates (also called builder's plates). 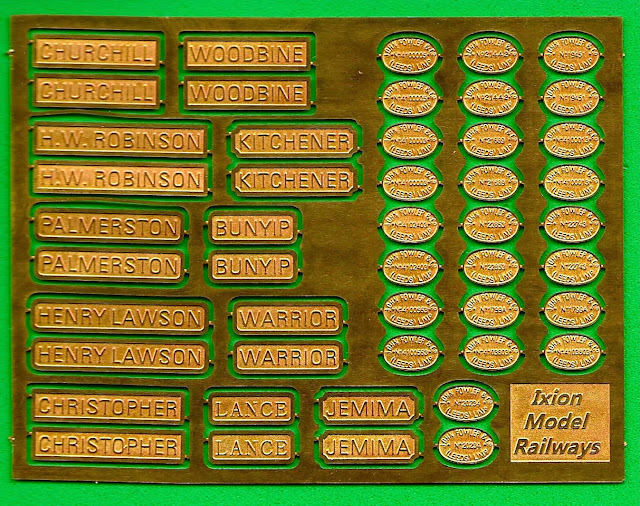 The correct ones for the GWR-liveried loco are the pair in the top right-hand corner, one above the other. So, from your photo, I'd say the left hand lamps which are smaller must be the LMS ones. Not sure about the handles, whichever are the smaller ones, so probably the right hand ones, though not sure about the kink in them. Hopefully the photos will help! Thanks, Andrew. No matter which ones you might use, you'll need a steady hand, fine pliers, superglue and maybe a magnifier to put these together! There are also a pair of dummy electric lamps, also supplied with clear glass lenses. Chris Klein has fitted these to his resprayed black loco - look at the post before this one. We like to think you get excellent value for money when you buy an Ixion loco, and the feedback from our O gauge customers indicates that they love the extras that we include. Next, I'll post a picture of the etched brass fret and the moulded tools that comes with our Hudswell Clarke 0-6-0ST loco. Note that both the steam and diesel moulded tool sets are also available for separate sale - ask at your Ixion stockist.